How exciting! We finally get to put our little dragon puzzle pieces together! Thank you for joining me on this exciting adventure! My first crochet along has been a wild success and so much fun, I can't wait to bring you another one! 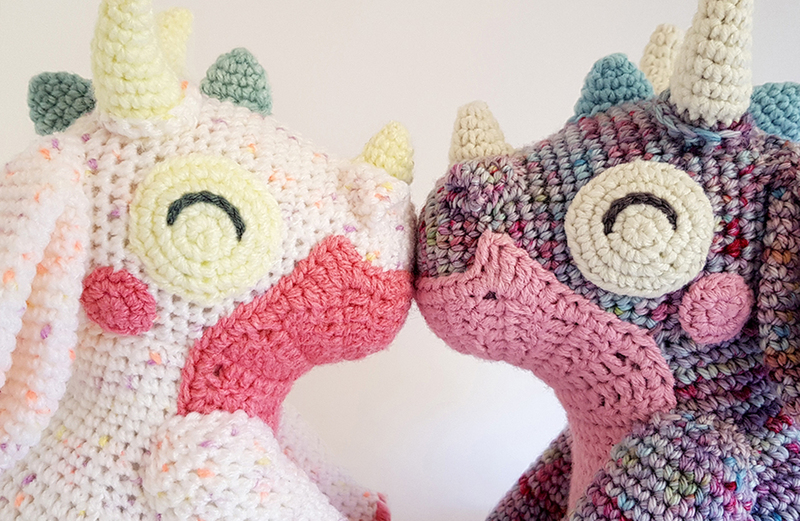 Over 20,000 people have downloaded this pattern and I'm dying to see how all these dragons come out! Please share your photos with me! You can do that by joining the Projectarian Facebook group or use the #OrbitTheDragon hashtag on Instagram. You can tag me using @Projectarian on both platforms. If you're not on social media, pop me a message and attach some pictures! This is PART 4 of the Crochet Along and it contains instructions on how to position the pieces correctly and sew them in place to finish your project. Scroll down to read Part 4 or click here to download it. Examine your dragon from all angles when pinning, to make sure the pieces are symmetrically placed, and that the one half of your dragon is identical to the other half. It is important to place each piece as precisely as you can from the beginning. As you add more features like the horns and eyes, any inconsistencies will be amplified. 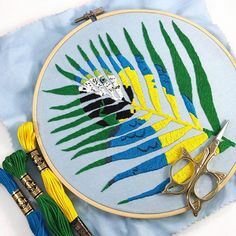 All pieces should be sewn with a whip stitch. See the Tips section for more info. If you’re having trouble with pins that keep falling out, insert the pins at an angle to create tension. The ball of the back of the head should nestle into the neck opening of the body. The lip around the neck should lay flat on the surface of the head, to help the 2 shapes blend into each other. IMPORTANT: When the body is upright, the head must be level and centered or the belly covering won’t fit properly. It should be positioned as if your dragon is looking straight ahead. Make sure the belly covering fits before you sew these pieces (remove some stuffing from the body if needed), then sew the head to the body. The narrower part is the top and goes on the dragon’s head, and the wider part is the bottom and goes on its body. Begin by lining up the top with the magic ring on the dragon’s head, and secure with a pin. Then line up the bottom with the magic ring on the dragon’s body, and secure with a pin. To make the dragon’s mouth, pin the top in a perfectly straight line across the front of the head, up to the 2 chains on either side. When you reach the chains, make a sharp corner to create the dragon’s smile. Stretch the belly covering slightly on either side of the neck area to pull the covering flush against the body. Pin on either side. Add some pins down the sides of the cheeks and finish pinning the Belly Covering straight down either side of the body. Sew in place, being careful to preserve the smiling shape of the mouth with those sharp corners. The arms are longer than the legs. They should not point straight forward but should rest on the ground. IMPORTANT: Sit your dragon upright then lean the body forward a little to its final sitting position. Pin the front legs in place so that they touch the ground, supporting the body in this position. The paws may rotate inwards to face each other at this stage, and that’s okay, as long as they touch the ground. If they don’t touch the ground, lean the body further forward or move the arms lower down the body until they do. Squash them onto the body as you pin them in place, so that they blend into the shape of the body. Make sure they’re in the same place on either side of the body, and that the body is centred, not leaning to one side. Pin around the shoulders but do not pin the under-arms. Before sewing the arms, pin the tail on then move onto Part 2 of the arms. If you don’t have enough pins, at least pin everything roughly in place to make sure it fits where it should. The tail should curve up at the tip. This is the correct orientation. Sit your dragon on your work table then place the tail on the dragon’s bum, so that the tail also rests on the table. Make sure it is centred with the body. Pin the top and the bottom first. The lip around the tail’s opening should lie flush against the body. You can stretch the lip over the body as you pin it to blend the pieces together. To do this, insert a pin into a stitch on the tail, stretch it slightly, then push the pin into the body. Sew the tail in place. To fill up any hollow areas around the lip, you can add stuffing as you pin, or keep stuffing as you sew. For example, sew the bottom half of the tail in place, then add some stuffing to the area you’ve just sewn (you’ll have to remove some pins to put the stuffing in, then replace the pins). Sew the next quarter closed, then stuff, and so on. Do not overstuff. The tail should not bulge around the join, it should blend into the shape of the body. When stuffed correctly, the tail looks like it’s made in one piece with the body. Ensuring that the front legs and tail still touch the ground, sew the front legs in place using small stitches spaced closely together. Do not sew the underarms. Sew around the shoulder, and to secure the stitches near the underarms, make a knot on either side of the un-sewn area, marked below with pins (arms and legs shown). Your dragon should balance on its own at this point. Place the back legs on either side of the body, squashing them on as you pin so that they blend into the shape of the body. Position the legs so they are right at the perimeter of the tail’s join, and so that they rest on the ground. Pin around the thigh, but not the inner thigh (in the same way as you left the underarm un-pinned). Sew with small, closely spaced stitches. Place the eyes in the exact centre of the head, on the side of the face. Draw a line from your magic ring to the end of your last row, across the side of the face, then place the centre of the eye on this line. The eye should be exactly halfway between the tip of nose and the back of the head. Rotation: the tips of the smile in the eye should touch the centre line of the head. Make sure the cheek fits in the remaining space (see cheek assembly). You may sew the loose ends from the smile line into the head to conceal them when attaching the eye to the head. Do not pack the loose ends under the eye when sewing – they will make it bulge from the head. The eye should lay flat against the head. Place the cheek to the bottom and to the side of the eye. It should not overlap the line where the head joins the body. Pin and sew in place. Do not stuff the fins or sew them closed. Place the fins so they look evenly spaced down the centre back of the head and body. Start with a medium fin directly above the eye in the centre of the head. Place the smallest fin near the tip of the tail, and the second medium fin after it. All the large fins should fit in between. Sew into front loops only to attach the fins. Sew all the way around the fin; around one side, then the other. The curved horns should point TOWARDS EACH OTHER, at the same angle as each other. Place horns between the top 2 fins, centred in the space available above the eye. To sew the horns, insert your needle into the same part of every stitch on the last row of the rim as you sew. When you look at the rim, you will see the back of the stitches because the rim has been flipped up. Each stitch makes an upside-down V-shape. Sew into one loop of each V to attach the horn. Place the small horn on the top of the dragon’s muzzle, in the centre. There should be about 6 or 7 rows open between the horn and the magic ring from the nose on the head. Sew into the horn’s front loops only to attach. Place the nostrils in between the front horn, and the corners of the mouth, at a 45 degree angle from the top fin. They should not point directly forward or sideways, but in between. Squash them down just a little to flatten the bottom, so they’ll blend into the face and look like part of it. Pin in place and sew. Sew around the back of the tube, and when you get to the front, sew the bottom of the nostril rim down, then finish attaching the back of the tube. When correctly sewn, the nostrils will look like one with the head. Sew the ear closed at the last 4 rows. Counting from the last row, place an ear at row 7 or 8, about 3 stitches away from the fin. Secure it with one pin, then pull the bottom tip of the ear straight down towards the ground. Pin and sew around the last 4 rows, sewing under the ear at the 4th row to secure it. I hope you have enjoyed this crochet-along! This pattern will ALWAYS be free, but if you would like to make a contribution to help me keep the free content coming, click on the button to donate via PayPal. Thank you for your support!